Divination Magick Book "Psychic ability and divination by way of the supernatural"
BRAND NEW, Copyright Solar-Vision 2013, Softcover, 48 Pages!! 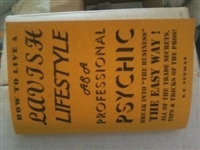 How to live a lavish Lifestyle as a professional Psychic "Break into the business the easy way"
Brand New, Softcover, 2012, Copyright Solar-Vision, a whopping 48 pages JAM-PACKED with useful information. Softcover. WHAT DOES IT TAKE TO BECOME A PROFESSIONAL PSYCHIC? OFFERING CLIENTS A “FREE GIFT” TO KEEP THEM COMING BACK! WORKING FOR A 1-900 LINE – FROM THE COMFORT OF YOUR OWN HOME! How would you like to learn to become a PROFESSIONAL TAROT CARD READER? How would you like to actually MEMORIZE the entire deck of 78 TAROT CARDS and their meanings in as little as ONE EVENING? As outlandish as this sounds, I GUARANTEE you it is possible by having this new book. This book utilizes exclusive state-of-the-art cognitive picture-association technology to allow you to RAPIDLY MEMORIZE the entire "RIDER-WAITE" Tarot Card deck (THE most famous Tarot card deck on the PLANET!). With this book, it is possible for you to actually MEMORIZE the entire deck of cards in as little as one evening. PROVEN, SURE HELP IS NOW HERE! OK, I’VE MEMORIZED THE ENTIRE DECK … WHAT NOW? I WANT TO “GO PRO” AND DO THIS FOR A LIVING – WHAT SHOULD I DO NEXT? ASKING “YES” OR “NO” QUESTIONS WITH THE TAROT CARD DECK. DO WE HAVE CONTROL OVER OUR DESTINIES? OTHER tarot card books promise you can get started right away, but in fact what they REALLY teach you to do is to do a Tarot "spread" and then "read" the cards by looking each card up in the book - ANYBODY can do that!!! THIS BOOK not only teaches you how to do Tarot spreads for yourself, your friends, your family, and others, but while you do these spreads you will be a CONFIDENT Tarot Card reader - having committed all of the cards to MEMORY!! If you would like to go into business as a PROFESSIONAL PSYCHIC TAROT CARD READER, then this is the book you're looking for. It's an "all in one" course taking you from starting at nothing to becoming a skilled, CONFIDENT Tarot card reader. You'll even learn how to go into "the business", working at psychic fairs, bookstores, or for a 1-900 number psychic. The possibilities are endless and the future is bright. I promise you this is the book that will make your dreams of becoming a confident Psychic Tarot card reader a REALITY, or your money will be cheerfully refunded. 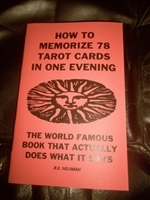 The book "HOW TO MEMORIZE 78 TAROT CARDS IN 1 EVENING" is only $12.95, and this includes FREE "rush" shipping in the US. These are going fast, so don't delay. This is the "lost" mystical "holy oracle" of a secret society from the 20's, 30's and 40's. 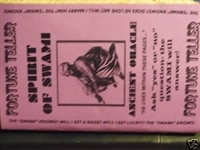 Legend has it the "one of a kind" handwritten book has been lost for over 60 years, but has recently mysteriously "resurfaced"..
A special set of charged "Magic Dice" specifically designed for use with the "Spirit of Swami" oracle book is INCLUDED!! Study of harmony in numbers. True interpretations of dreams, how to find lucky numbers. Complete dream book and policy player's guide. Contains several one or two digit numbers for dreams in hundreds of interpretations.it also has ladies and gentlemen's names lists with lucky numbers.